IRRMA and the Shenandoah Chamber & Industry Association presented this 'Rock the Roof Road Show' outdoor event. The Association brought together 3 IRRMA Hall of Fame bands, plus a special guest appearance by local rock band "3rd Watch" - The Thunderbirds (HOF 2006), Con Brio (HOF 2009) and T.E.R. (a combination of 3 HOF bands - Terra Firma (HOF 2008), the Esquires (HOF 1999) and Roze (HOF 2006). The proceeds from this event helped cover the Everly Brothers House Restoration Project and the Iowa Rock & Roll Music Associations Rock education and scholarship programs. Help "keep the music alive"! IRRMA "Rock the Roof" event! P/O the Shenandoah "All Alumni" bash - parade / events / music. Four IRRMA Rock n' Roll Hall of Fame bands! (including the Thunderbirds) and Richie Lee! Here's some "settin' up" photos from April 4th, 2008 at the Marriott Convention Center in Coralville, Iowa. Hoistin' the Peavey - Where are the roadies? and Steve "fixin' the mixer". The Thunderbirds rocked the house at the Boogaloo Cafe - Fun City. This venue also hosts the Catfish Bend Casino. Jerry Dietz of KCSI Radio interviews Steve, Stan and Carl prior to the bands performance. Note the Thunderbird in the background - parked next to the stage. The band performing at the car show. That's Loren Paulson, Iowa Rock'nRoll Music Association President, in a guest appearance on the sax with the Thunderbirds. Loren gave a fine rendition of the sax solo on Wooly Bully. The IRRMA "Hall of Fame All Star Band" during the jam at the end of the evening. 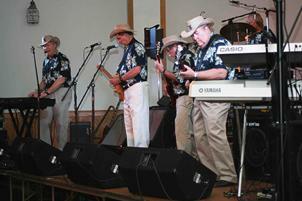 In September of 2006, the Thunderbirds played a benefit at the Corning, Iowa Opera House. This relic from the turn-of-the-20th century is undergoing a complete restoration, and the Thunderbirds did their part by conducting a benefit concert on the original stage. This was the 1st performance on the Opera House stage in well over 50 years. Note the walls behind the stage which were covered with posters and graffiti from prior performances - all the way back to 1902. The house was filled and the event ended up being more of a "sock hop" than a formal concert - certainly not an Opera! This was also the 1st occasion for the Thunderbirds to use their new band trailer - see the photo. Getting the equipment there was easy. Getting it up the ancient, narrow stairs was another story. Click on the icon for a video clip from the Thunderbirds Corning, Iowa Opera House performance. The Thunderbirds appear at many outdoor venues. Here they are at a street dance in Bedford, Iowa in late September, 2006. Click on the icon for a video clip from the Thunderbirds Bedford, Iowa performance. The very 1st time the Thunderbirds appeared as a band was for a Sadie Hawkin's dance. (If you know what that is, you are on the right web site!) It was held in the Lenox, Iowa High School gym in the Fall of 1964 (we estimate). On July 29th of 2006, the new Thunderbirds decided to start off exactly where the original Thunderbirds started - on the very same Lenox High school gym stage! By now, the old gym was the home of the Lenox American Legion chapter, but the same stage was still there! Loren Paulsen, IRRMA President, came up to introduce the band to a packed house. I'm pretty sure there were some folks there in 2006 that also attended the launch of the Thunderbirds in 1964! This was a warm-up for the IRRMA Hall of Fame Induction. Click on the icon for a video clip from the Thunderbirds Lenox, Iowa performance.